Socket shoulder bolts also known as shoulder screws. Socket head shoulder bolts have a cylindrical, precision-made piece that measures from the bottom of the bolt head to the top of the threaded area known as a "shoulder". 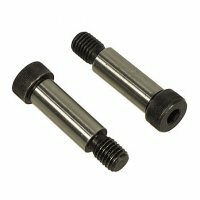 The threaded section of the bolt attaches the bolt to a pre-threaded hole, while the shoulder allows a pivot point or a revolving joint to be created in a mechanism or linkage. This allows the the machine or material to spin freely around the bolt.